President Obama is a Christian. The persistent belief that he is a Muslim highlights the significance of Islamophobia in the United States today. The implication, of course, is that a Muslim should not be President. Remarkably, this false belief remained widespread even after former Joint Chiefs of Staff Chairman Colin Powell endorsed Obama during his 2008 presidential bid. General Powell emphatically insisted that even if Obama was a Muslim, that was no reason to disqualify him. Yet even this bold show of support from one of the country’s most decorated military officials could not make this belief disappear. A July 2012 poll of registered voters found that 17% believed it, up from 12% in October 2008. That Obama won the 2008 presidential election signifies that there is still hope for overcoming Islamophobia. Indeed, elections can prove essential in defeating it. Islamophobia is a problematic term that has become a popular way of referring to bigotry, hate crimes, discrimination, policies, and practices directed against a range of communities including Muslims. Despite the appearance of Islam in Islamophobia, neither Islam nor Muslims are its exclusive targets, for Arabs, South Asians, and other ethnic communities—whether Muslim or not—are also confronted with it. The consistent discrimination and hate crimes suffered by Sikhs who are “mistaken for Muslims” serve as stark reminders that religion alone cannot explain why this phenomenon persists. Islamophobia, in the form of rhetoric and concrete policies issuing from this mistaken belief, remains one of the most pressing issues in the 2012 elections and will remain relevant in both the 2013 and 2014 “off-year” elections. Islamophobia is a complex—but not an intractable— issue. While changing culture and attitudes will take time, many of this phenomenon’s aspects can be effectively addressed by changes in policy. Local and state elections enable voters to elect officials who can make such policy changes. The importance of local elections in the Islamophobia phenomenon is all too easy to see. Some public officials elected at the local level during the “off-year” elections constitute Islamophobia’s most prominent promoters. One of them, Representative Michelle Bachmann (R-MN), who was first elected in 2006 and actively sought the 2012 presidential nomination, has been a leading promoter of Islamophobia nationwide. In 2012, she initiated a McCarthy-esque witch hunt, accusing Muslims employed by the federal government of representing “serious security concerns” due to their “deep penetration in the halls of our United States government.” Similarly, Representative Peter King (R-NY) has held congressional hearings about the supposed “radicalization” of American Muslims. At a 2012 town hall meeting, Representative Joe Walsh (R-IL) stated that there is a “real threat” because Muslims are “trying to kill Americans every week.” All three of these public officials were elected or reelected during the so-called midterm elections held two years after a presidential election. During these midterm and “off-year” elections (the latter being held during odd-numbered years), American voters make major decisions that have the power to impact Islamophobic policies. Locally elected officials (e.g., mayors, city council and school board members, judges, and sheriffs) hold key policy-making positions that can either promote or eliminate this form of xenophobia. For example, city councils have frequently debated the right to build mosques and community centers. Holding elected officials accountable for opposing bigoted policies makes participating in local and state elections crucial. Realistically, Islamophobia will remain a serious national problem even after two or three election cycles, because many Islamophobic policies, including those discussed below, enjoy wide public support. Various factors are responsible for this, among them widespread bigotry and the unquestioned need for innovative and tough counterterrorism policies. This latter reason represents a significant political hurdle for those elected officials who seek to challenge any counterterrorism policy, no matter how discriminatory. In short, the current political climate needs to be changed so that those who ask reasonable questions about current or envisaged counterterrorism policies will not be accused of “being soft on terrorism.” Such change often begins at the local level. As regards changing the American public’s opinion about Muslims and Islam, the road ahead is quite long. Public opinion polls show that large numbers of Americans have a negative view of Muslims and Islam. Counter-terrorism officials mistakenly focus on religiosity as a signal of potential terrorist activity. Sharia is falsely promoted as a dire threat to the Constitution and the American way of life. American jurisprudence employs preemptive terrorism prosecutions almost exclusively against Muslims. After describing recent research in these areas, the brief presents policy recommendations that center on the crucial importance of American Muslims and their allies working together to bring about the implementation of policy solutions. The 2012, 2013, and 2014 elections will be instrumental in this undertaking, because any realistic solution requires the cooperation and support of local and state-level public officials elected during these “off-year” and midterm elections. 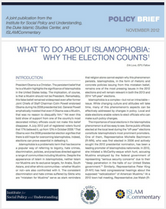 This policy brief is published by ISPU, DISC and ISLAMiCommentary. This policy brief was adapted from an ISPU panel at the 49th Annual ISNA Convention. Some of the content came from participating panelists including ISPU Fellows Asma Uddin, Engy Abdelkader, and Dr. Ihsan Bagby, as well as Steve Downs.